It wasn’t immediately clear whether McGlover had an attorney. 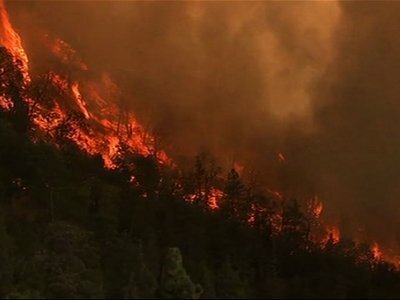 “We had one guest who planned a weeklong trip,” said Tom Lambert, who owns a vacation rental property near Yosemite Valley. “It was a father-daughter trip, for her high school graduation ... Now it’s done. It’s sad.” Another guest had to delay plans to climb Half Dome. “People have been very understanding,” Gediman said. Gediman suggested valley visitors divert to Tuolumne Meadows, on Yosemite’s northern edge, or to Sequoia and Kings Canyon National Parks to the south. In the state’s far north, a 7-square-mile (18-square-kilometer) wildfire has forced the evacuation of French Gulch, a small Shasta County community that dates to the Gold Rush.